Don't live in Orlando? Click here for my nationwide list of squirrel trappers! Squirrel Info: Squirrels are members of the rodent family. The most frequently dealt with nuisance squirrel is the Eastern Gray Squirrel. They measure around 16-18 inches from nose to tail and weigh approximately one pound. Gray squirrels are active year-round and arboreal, meaning that they live primarily in trees. They feed on a great variety of foods, such as nuts, seeds, fungi, fruits, and of course the seed in your birdfeeder. They store nuts and acorns in holes in the ground. 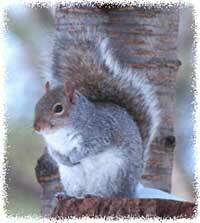 Gray squirrels breed throughout the year, but there are two distinct peaks, in the late winter and late summer. After about six weeks, two to four young are born, and raised in a nest for about three months. They prefer cavities in trees (or homes), and when cavities aren?t available, they will build a nest out of leaves and twigs high in a tree. They are most active in the morning and evening. Like all rodents, they gnaw in order to wear down their teeth. They are of course very agile and amazing climbers. Nuisance concerns: Squirrels have easily adapted to humans. They frequently use buildings as nesting areas. Squirrels love to stay in an attic or soffit. They often find a small opening and will chew a wider hole to gain access to the building. They bring nesting material into the home, and make quite a bit of noise scurrying around and caching nuts. Most people hear the running in the morning and evening. They often fall down the chimney flu and make a lot of noise or enter the fireplace. Sometimes they fall down a wall from the attic and get stuck. They often chew their way into commercial buildings or apartments. They often enter the attic through the gable vent. Squirrels can cause a fire hazard in homes by bringing in nesting material, and by chewing on power lines. Squirrels can leave behind a lot of droppings and urine in the attic. The droppings not only smell bad, but they pose a biohazardous risk, and the smell attracts new squirrels. I often recommend attic decontamination services if you've had squirrels living in your attic. Click here for my squirrel photo gallery. 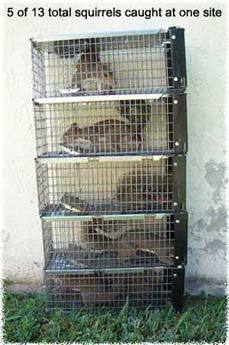 Click for examples of squirrel trapping jobs I've done. AAAnimal Control will whirl and twirl that squirrel! You go girl! Click here for squirrel job prices. Click here for pictures of a barrier in an attic vent that squirrels were using. Click here for photos of a flawed chimney cap - and the fix. Click here for photos of squirrels cut out of a wall. Click here for photos of squirrel removal 3 stories high. Click here for photos of squirrels entering through gable vent. I have personally trained wildlife professionals throughout the country. Click the above banner to find the pro I recommend in your city or town. 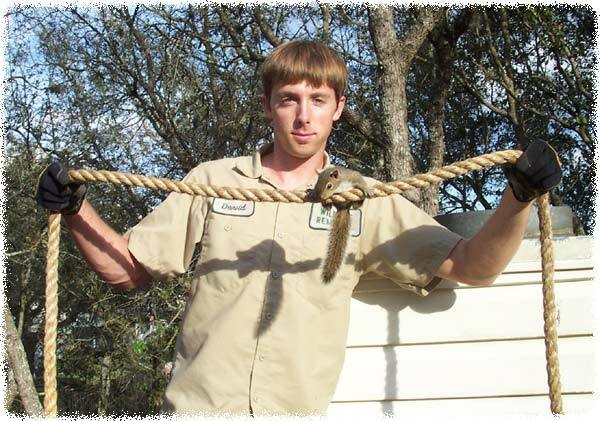 Click here if you need Tampa Squirrel Control in the Tampa Bay and Clearwater / St. Petersburg area by my friend Mike. I try to educate the public as much as possible about squirrel removal, but in many cases, this is not a do-it-yourself job. It is more complex than plumbing or electrical work, and more laws are involved, as well. I have seen so many homeowners attempt to solve a squirrel problem themselves, and end up with problems, such as unintentionally trapping squirrels inside an attic, and then having those squirrels frantically chew wires and drywall into the home, etc. When in doubt hire someone with the experience and equipment to do the squirrel removal job correctly.